It is undoubtedly true that aerials work much better without a roof in the way of the transmissions but TV antennas can work reasonably well in lofts provided your signal strength is reasonable or, preferably, good. One should bear in mind that when the transmission power went up considerably at switchover (e.g. Crystal Palace went from 20kW to 200kW ! ) many more sites are in decent signal areas than was the case before. 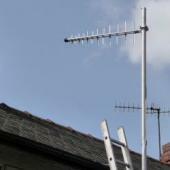 On the other hand, in poor signal areas we do not normally recommend installing loft TV aerials, though some people have no choice as there may be planning restrictions on outside antennas or access problems may be too severe. Bearing in mind the loss in signal caused by the roof it may be advisable to go for a slightly higher gain antenna than normally recommended for an (outside) aerial in your location. 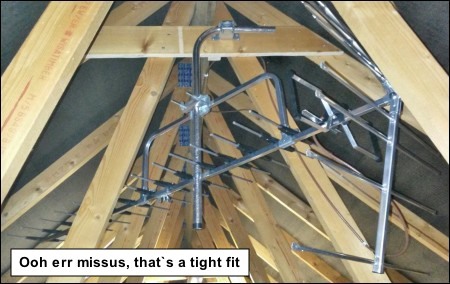 Remember that if your aerial is mounted outside but pointing back through the roof, or with insufficient clearance over it, then it may actually be preferable to install it in your roof space ! is proportional to the frequency. The higher the frequency the higher the loss. VHF signals (FM / DAB) will suffer the least attenuation. 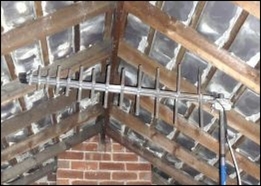 UHF (TV) signals will be more affected by the roof. Satellite frequencies* will result in no usable signal getting through the roof. Just how much difference does aerial positioning in a loft make ? With the usual caveats about RF tests, I decided to try and put some figures on it. A similar aerial installed on the roof at this location (which would admittedly be about 9ft higher than the 30” datum) averages about 58 dBμV, so installing it in the loft loses about 8 dB,which is about 60% of the signal. The test loft (roofed in Welsh Slate) is in a poor to medium signal area and I must admit I wouldn`t normally recommend fitting an aerial in the loft with a signal level this low unless you have no alternative. Furthermore the location does not have line of site to the transmitter, which from a test point of view makes readings even more erratic. Mind you most loft locations probably don`t have line of site to the transmitter (because the aerial is usually mounted lower than it would be outside) so from that point of view it`s more realistic ! Basically I mounted our usual test aerial (a DM Log Periodic) on a temporarily modified camera tripod and moved it all over the loft taking signal readings as I went. To be frank I ran out of time to do as much as I had originally wanted but on reflection I found out enough as it was.I started off in the middle of the loft space (about 18” above the joist line) and then moved the aerial up one foot at a time. The tripod wouldn`t go any lower than 18” but it was pretty obvious (if anything in RF is obvious, which it isn`t...) that the signal was dropping as the aerial was lowered anyway. The loft isn`t broadside on to the transmitter (Crosspool) which meant aiming the aerial about 45 degrees across to the roof. It also meant that when testing it through the end wall it wasn`t aiming perpendicularly through it. The figures in blue are for the signal strength (in dBμV) at a point 30” above the roof joists and in the middle of the loft. at points 18”, 42” and 54” above the joists, i.e. 12” below, 12” above and 24” above the 30” datum. The aerial was then moved forwards right up to the roof (at the 54” height) and the relative figures for this location are given in the end column. The results table of the main test tells its own story really. The peak reading on average was at 30” above the joists, which was more or less bang slap in the middle of the loft. But the signal level on some of the frequencies was anything but peaked at that height. Even more significant was the drop off of on some of the channels (CH31 in particular) as the aerial was raised. Two readings were taken on every channel but on CH31 I took four, just to be sure, and it was consistently way down. 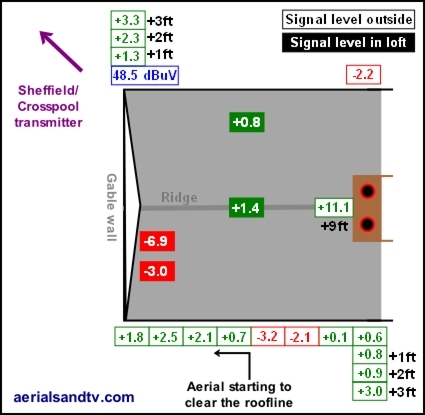 Let`s just think about this a bit, moving the aerial up one foot knocked 5 dB off the signal on CH31 (which was analogue BBC1 off Crosspool / Sheffield). Then moving it up another foot knocked another 5 dB off it ! ? ! That`s 10dB in total and that`s a huge amount. To put it into perspective, that`s probably more of a difference than you`d get swapping from a crappy little wideband aerial for an XB16A! Just to make it more interesting the signal on most of the other channels varied by up 3 or 4dB (up or down according to location) and that`s also a significant amount. It`s the kind of difference in gain between a Log36 and an XB22WB ! Similar differences in signal levels were found when the aerial was moved to the sides and front to back, and as an example I moved the aerial as far forwards as possible up to the roof. I`ve read elsewhere that this position can sometimes give maximum signal, all I can say is that it didn`t in this particular case ! Next I deliberately aimed the aerial towards the transmitter through the end wall, which is double thickness brick. It must be admitted that some of these signal levels are getting so low that the readings were unreliable but it still be seen that aligning the aerial through the end wall knocks the signal down significantly, which is to be expected. I was surprised, yet again, that there was a 4 dB (average) gain increase by moving the antenna only one foot to the side, particularly as Position 2 was where one would expect the signal to be dropping. Note the difference in signal can vary significantly according to the frequency / wavelength. The signal on CH60 was the same at all three positions, i.e. it was the same through the end wall as in the middle of the loft ! 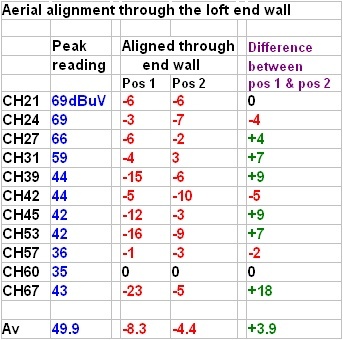 On the other hand the end wall reduced CH39 by a whopping 15dB at Position 1 but recovered to “only” minus 6 dB at Position 2, that`s a huge 9 dB difference just by moving the aerial twelve inches ! I know that CH67 (was analogue C5) actually showed an 18dB difference ( ! ) , but the signal level was so low for the readings in Position 1 that it wasn`t really reliable. Moving an aerial around a loft will generally affect the signal level quite markedly, even more so than outdoors, and the point of maximum signal will vary for different frequencies. In a strong signal area this may not matter too much, but unless you have the luck to live in one of those then time spent searching out the area of greatest signal may well be a good investment. Aligning the antenna onto the transmitter through the end wall usually attenuates the signal more than aligning it through the roof. Lastly, if getting desperate, do not ignore any possibility as to where the location of maximum signal may be. The figures in blue are for the signal strength (in dBμV) at a point in the middle of the loft. The alignment to the transmitter was at an angle of about 45 degrees to the wall. Position 1 was nearer the edge of the wall (at the transmitter end), whereas position 2 was more towards the centre. These particular tests were originally designed to find the attenuation through a roof, in this case Welsh slate. The plan was to check the signal level on the far side of the roof (from the transmitter), then in the loft, and then finally on the near side of the roof. I then hoped (some hope....) that subtracting the signal levels it would give the attenuation through the roof slates. Getting an aerial (temporarily) at the same height as one in the loft was not that straight forward, but, at some risk to myself, bolting a 10ft pole (with a DM log aerial mounted on it) to a previously erected ladder seemed to work reasonably well. I started off taking the readings behind the roof, at the East end of the building, as far away from a line of sight to Crosspool transmitter as possible. Then I worked towards the West end of the house taking readings (at the same height) every two feet. I expected the signal to get much larger when the aerial started clearing the roof line and to be fair it did go up, but no where near as much as it should have done. By the time I got to the West end of the building the aerial was a good 4ft above the roof, yet the signal was only about 2dB up ! ? ! It was dawning on me that the original purpose of these tests was in ashes. All that bleedin` effort, for nothing. Now signal levels can sometimes change for no apparent reason, so I did wonder if they`d still be the same after I`d remotivated myself to continue. When I do aerial tests I always take at least two readings, but in this case I just spot checked the West end and the East end of the house (including plus 1ft, 2ft & 3 ft), and I have to tell you they were exactly as they were before. I removed the pole and aerial from the ladder and took everything round to the front of the house, that`s the transmitter side of the building, although there are houses in the way on the other side of the road and large trees beyond them. I reattached the pole/aerial (at no small risk to myself) to the ladder and tentatively took the readings. I`ll say it again (but louder this time). HOW CAN THAT BE ? ! ? Thoroughly demoralised I just took readings at the East end and at the West end (including plus 1, 2 & 3ft), then I called it a day. It was only later that I realised that this was a textbook example (if that`s possible) of RF being a Black Art, so perhaps the time wasn`t wasted after all ! Note that there is more signal at the back of the house than at the front ! ? In fact there`s more signal in the loft than at the front of the house ! Obviously the most signal is produced by the aerial on the chimney, it`s a whopping 11.1 dB up. Nett of the splitter (in its downlead) the aerial is about the same gain as a DM Log but installed 9ft higher, however, even that doesn`t have clear line of sight to the transmitter. The above figures are the averages for the 11 transmitted channels (at the time it was 5 analogue & 6 digital) from Crosspool. There was even more variation in the signal strengths of the individual frequencies. Just across the back of the house CH27 varied by “only” 5dB (still a significant amount.....), but CHs 45 & 67 varied by a huge 14 dB. Under these sort of circumstances you really should have a lot of sympathy for your aerial installer, or yourself if DIYing ! So how can this be ? Well, whilst I am pretty sure the fact there`s no line of sight to the transmitter is significant, I`ve really no idea. I thought that the most likely cause was diffraction off the roof ridge, but the signals off Crosspool are vertically polarised, so I`d have thought that made that less likely ? The only other thing could be reflection off the houses (or the large tree) behind, but they don`t seem to be in the right plane (see below) to accomplish that. The conclusion is that there is no conclusion. I accept the above scenario is rare, but it exists, you`ve just read it with your own eyes. Actually there is a conclusion, well a sort of conclusion. This test proves the adage that RF is a Black Art and (almost) anything is possible. It also underlines the importance, yet again, of “Line Of Sight” to the transmitter. The fact this site doesn`t have that is, I feel, very significant. Our recommendations for loft aerials. Mounting an aerial in the loft. Amplifiers (and splitters) in the loft. Our aerial recommendations for lofts are dependent on your signal strength. In very strong signal areas on any transmitter we`d go for a DM Log Periodic (or Log36). For medium and (especially) weak areas our aerial recommendation would depend on which transmitter you are on, see article “Which Transmitter Am I On”. For A group transmitters (e.g. Crystal Palace in London) we`d recommend an XB10A. For B group transmitters (e.g. Sutton Coldfield in Birmingham) we`d go for an XB10B. For K group transmitters (e.g. Bilsdale SSE of Middlesborough) we`d choose an XB10K. For all other transmitters I`d go for a DY14WB. Although it is fine to mount the aerial by suspending it from the rafters by string (preferably not by wire though ! ) aligning it whilst using this method is obviously a little problematic, so most people use a loft mounting kit. I would normally advise using the “L section” kit because it`s more flexible in its use. Remember you may need to suspend the aerial from the roof truss, but by reversing the “L section” in its bracket (it can also be cut to a straight) you can also use it to mount on a joist. If necessary the pole will also fit into the side of the 2 way surface bracket and then rotated to get an upright pole from a diagonal mounting ! To maximise your chances of being able to locate the aerial at the signal “sweet spot” it may be advisable to go for a slightly smaller aerial. This is a little problematic because there is no such thing as a small “high gain aerial”. That said, some are smaller than others, e.g. 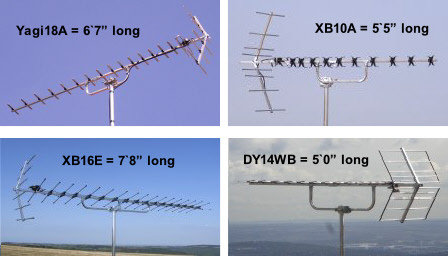 for loft installs in weaker signal areas, despite the fact they perform similarly, we would recommend an XB10A, B or K over the equivalent Yagi18, A or K. This is because they`re shorter and they can also be end mounted (although if mounting an XB10 outside we`d recommend cradle mounting it). On the other hand, for outside installs we`d normally go for the Yagi over the X Beam, because the Yagis are particularly strongly constructed and they`re a bit cheaper ! Though the latter fact should really be a minor point when you bear in mind an aerial installation should last 20 to 30 years (or more), and even longer than that if it`s in a loft. For loft installs on wideband transmitters we`d go for a DY14WB over a larger aerial such as an XB16E or an XB22WB, its gain may be marginally less, but its 2` 9” shorter. Many aerials in the loft use cable originally installed in the house walls, and the bad news is that this is almost always crappy “Low Loss Co Ax”. The article on cable explains why cable is so important, particularly for impulse interference with digital signals. The good news is that cable run in wall cavities is less likely to have degraded due to UV exposure and other weather related issues. There is no escaping the fact that it`s best practice to change the cable (particularly if it`s “Low Loss” stuff) but if changing the cable is really difficult I`d try your install with the old stuff first and see how you go. as unpredictable as these test results showed. which may work OK in a loft if the signal level in your area is sufficient. 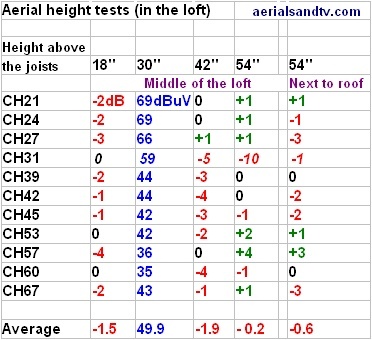 Do not confuse loft aerials with indoor / set top aerials. * Remember the frequency received at the dish is about 10x higher than the IF which is sent to the receiver box from the dish. One interesting point revealed by the above graphic is that the signals at the bottom end of the TV band (i.e. A group frequencies) should suffer less attenuation than at the top end (i.e. C/D group frequencies) and in fact the same applies to transmission through the air. Some correspondence on the MB21 E Mail list concluded that a signal at 500MHz (=@ CH24) would lose about 4dB less, over 20 miles, than one at 750MHz (=@CH56). Different roofing materials will attenuate the signal by differing amounts, though as far as I know no one has published any data on this, contact us if you know different ! 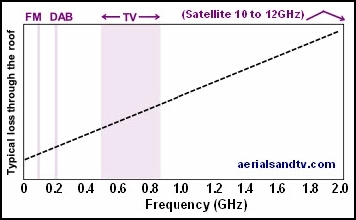 Generally speaking the losses (at TV frequencies) would be 3 to 10dB (decibels) which is about 30 to 70% of the signal. During tests inside a (Welsh slate) roof the TV signal was 8dB down on that from an aerial on the chimney, though the latter was installed 9ft higher. However some materials can result in significantly more loss than 8dB and no signal at all will be received through metal sheeting / foil. This includes solar panels which can greatly attenuate TV signals into lofts, which is actually what you`d expect, if you think about it. Some types of roofing material are semi porous and the attenuation level can rise if they get wet, though I have to say there was hardly any difference through the wet/dry Welsh slate roof when I was doing my testing. When installing an aerial in the loft, try to do it in the autumn or spring ! Being in a loft when the weather is warm can be unpleasant to put it mildly. Personally, for loft work, I`d even say winter would be preferable to a warm summer`s day. It goes without saying that the aerial alignment should normally be through the slates and not through the end wall(s), and this is particularly important if the house is a terrace and there are even more walls beyond the first ! That said, RF is such a Black Art that it`s always worth trying anything if you`re desperate. Remember we`re dealing with a roof space where RF waves are bouncing around all over the place, anything`s possible ! It is very important to remember that signal levels in lofts can vary significantly between locations within the roof space and the best location can vary even for different models of antenna. Furthermore the signal level can be markedly different for different frequencies (i.e. a particular digital MUX) at different locations ! This variation in signal level can be particularly marked if there are metal objects in the loft, e.g. water tanks. If the latter is in line with the transmitter then it would normally have a very negative effect on the received signal. It is also advisable to try and keep the aerial away from mains cables, at least 3ft, or more if possible. The cable could radiate interference if an unsuppressed load is in use (or an arcing switch) but remember that mains will only usually interfere with TV reception if there is noise on it, see interference tests on cable. It`s a good idea to start by placing the aerial in the middle of the loft, and at about 2/3 of the height of the roof space, then work from there. Bear in mind that in order to avoid aligning onto the transmitter through any end wall(s) you may have to place the aerial towards one end of the roof space. 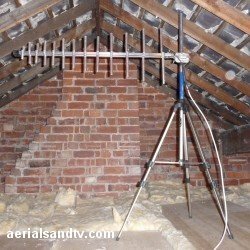 If you are struggling for signal then time must be invested in moving the aerial all over the loft, up/down, left/right and forward/backward in order to find the area of highest signal. If a customer ever has a problem with an aerial from us not working as well as they`d hoped (which, to be fair, is relatively rare) it`s nearly always a loft install*. 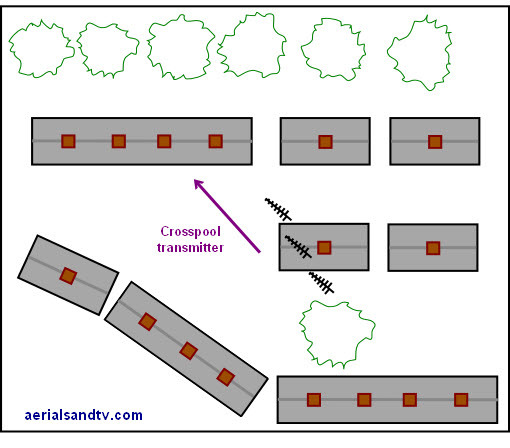 If we assume that cabling, connectors, wall plates, splitters and/or amps (including excessive signal) have checked out OK then I`d have thought that aerial positioning has to be the cause of most of these mysteries. One last useful point (sent in by John Allen) once your aerial is aligned it`s a good idea to paint a mark on the inside of the roof showing the direction of the transmitter. Thus, if the aerial is accidentally moved, say whilst retrieving your Christmas tree for its annual excursion, you can easily realign it…..
And this is how adaptable L section loft kits are…. This picture above also illustrates the fact an aerial can be mounted from the top as well as the bottom. Ideally the pole wouldn`t pass through the aerial`s elements, but, because the aerial and pole are opposite polarities, it wouldn`t actually make much difference. It is still possible to use an amplifier in the loft, if one is needed, even if you have no mains socket by utilising a mast head amp, although in this context the term “mast head” is obviously a misnomer. Amplifiers are not the answer to everything though....... Bear in mind that post switchover many more people don`t need amps and a splitter is the way to go. 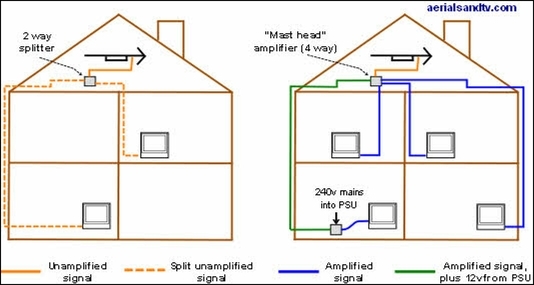 Splitting the signal in the loft using the aforementioned mast head amp (or, in reasonable signal areas, just a splitter) can be very convenient because it makes it easier to feed both sides of the house and/or feed the upstairs rooms straight through the ceiling(s). 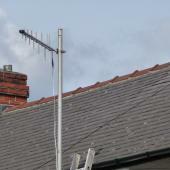 When trying to align your aerial only use a cheap signal level meter if you`re desperate. The best way is to take a portable TV in the loft with you (make sure it`s tuned to the transmitter you`re trying to pick up ! ) though it must be admitted that aligning a loft aerial was far easier in analogue TV days..... If using the signal level reading on your digital box/TV bear in mind they aren`t always to be relied on, but at the end of the day what really counts, is how often does your picture freeze or break up, forget any other signal level reading, even from a decent (i.e. £300) meter ! Remember that the maximum signal “sweet spot” for whole TV band may be in one place, but for an individual frequency (i.e. a particular analogue channel or one digital MUX) it may be somewhere else !